Barracuda is well known villains of the Marvel anti-hero the Punisher. 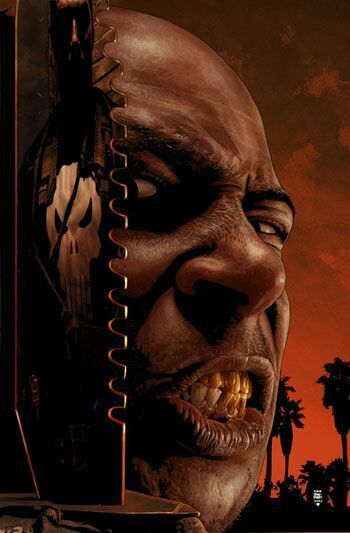 One of the destinctive elements of Barracuda is that he manages to survive the Punisher over numerous intereactions. There are not yet any mentions of Barracuda appearing in the MCU. Barracuda was created by writer Garth Ennis and Goran Palov. Garth Ennis stated at 2008 Philadelphia Wizard World Comic Con that the basis for Barracuda was the folk song Stagger Lee about "a large terrifying man and the terrifying things he does to people". The character proved to be popular with Punisher fans and for this reason Marvel urged Punisher writer Garth Ennis to allow Barracuda to survive the first story arc. This is somewhat A-typical for Punisher villains as most die very quickly after being introduced. Barracuda Bio: Who exactly is Barracuda? 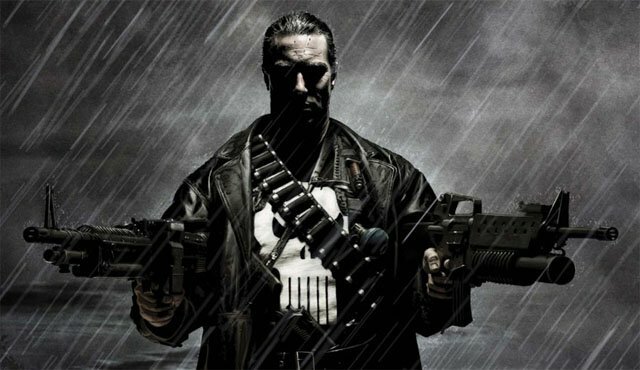 Is he the greatest Punisher villain ever? Barracuda's father placed his hands on burning grill and told his son that he need to be as "hard as the motherf'BEEPing world itself", The next day his father left his family and was never heard from again. At another point his mother left the family, leaving Barracuda to care for his two younger siblings. His sister became a narcotics user and a prostitute, his brother died young. 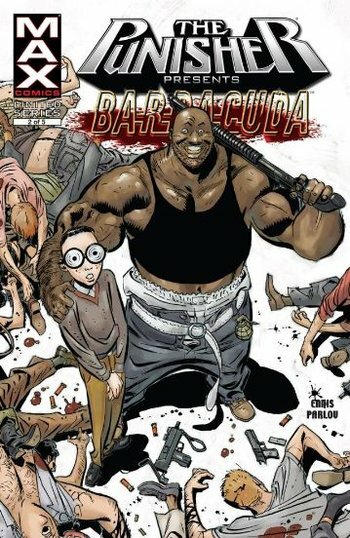 After a series of brutal fights where Barracuda baddly hurt other kids and prisoners he was recruited into the military. Barracuda's pain tolerance, willingness to commit extreme violence and moral apathy made him a perfect candidate for missions that required brutality. He made contacts with the CIA and intelligence community. He became involved in smuggling drugs to fund the contras. He said to have taken part in numerous attrocities of wiping out villages and even commiting cannibalism. At one point Nick Fury attempted to take down Barracuda but Barracuda was able to use his CIA contacts to avoid any form or prosecution. After leaving the military Barracuda became a gangster mercenary for hire. He began working for a criminal business man called Harry Ebbing. Harry wanted to shut down the powergrid in Florida to get a profit from fixing it. The power outage would cause a massive amount of human casualties but give Ebbing's business profitable. The Punisher had learned of Ebbing's scheme and was hunting him down and all of his associates. To counter the Punisher, Ebbing hired Barracuda to kill the vigalante. Despite losing an eye, and fingers he manages to win his first fight with Punisher. He takes the Punisher out to sea to feed him to sharks. A subdued Punisher points out that Barracuda has lost his opportunity to reattach his fingers and Barracuda's laughs and throws his own fingers into the sea. The Punisher manages to hide in the water and hold on to the boat. Barracuda assumes he has killed him. The Punisher takes down an entire yacht with all of the top employees of the company planning to shut down the powergrid. The employees all in on the scheme are being eaten by sharks when Barracuda attempts to jump onto the Punisher's boat. There he is shot at point blank range and falls into the water. He manages to survive though in the same way the Punisher did by holding onto the end of the boat. Barracuda gets mixed up between two drug cartel families. After betraying both families he begins to enact his own plan to take over, however by the end all of the members of both families are dead and Barracuda is alone on a life raft with the former mistress of one of the cartel bosses. She worries about how the pair will survive in the sea with nothing to eat, while Barracuda ponders about eating her. The climatic battle between the Punisher and Barracuda is a bloody mess as both men deliver near fatal blows to each other. Barracuda learns that the Punisher has an illigetmate daughter from a tyrst with Kathryn O'Brien. The child is the care of one of Obrien's sister. Barracuda first tries to blow up a building with Frank and a group of mobsters in it. However, the Punisher finds the explosives and escapes the explosion. Barracuda finds and captures Punisher who was wounded in the blast. When the Punisher awakens he is tied to a chair. Barracuda begins gloating and reveals that Frank has a daughter. Enraged the Punisher breaks his bonds and bites off Barricuda's cheek. The two continue to battle but Barracuda gets the upper hand and tosses the Punisher out a window where he lands on a police car and is arrested/hospitalized. He convinces the hospital staff that they all will be kill by Barracuda if they don't let him go and so he stumbles out of the hospital and after Barricuda. Barracuda and Frank race to get Frank's daughter. Barracuda gets their first and when Frank arrives he seemingly kills the child but it is only a decoy. Frank overcomes his emotions and the two enter a ferocious battle in which Frank eventually wins. He tortures the location of the girl out of Barracuda. The fight again in which Frnak shoots Barracuda multiple times and eventually saws him in half with an AK-47. Frank's daughter Sarah is returned to live with her mother. Later it is revealed in Valley Forge that Barracude was sent by US Generals to silence the Punisher. Barracuda is one of the few non super powered villains that have managed to defeat the Punisher in a fight. He is also one of the few villains to survive numerous engagements with the Punisher. Insanely high pain tolerance and durability. Barracuda is able to be stabbed in the eye, shot, lose fingers and still keep fighting at a high level. There are no mentions of Barrauda appearing in the MCU at this time. Barracuda was mentioned by Jon Bernthal (Frank Castle / Punisher) as a villain he would like to see in an upcoming season of Punisher.